Over eighty years ago, so the story goes, the great French theatre director Jacques Copeau was confronted by a young student so hopelessly consumed with self-consciousness that in a desperate but inspired moment he covered her face with a handkerchief. With her face covered in this way she was able to find a new confidence and a freedom on the stage. From this moment of inspiration Copeau got the idea of using masks in training actors and in so doing he opened up a huge field of experiment and investigation that even today is still in its infancy. Today in the UK, the success of theatre companies specialising in masks, such as Trestle, Trading Faces and Face Pack, has stimulated interest and developed a following for mask work in education, training, theatre audiences and the general public. The four articles in this issue show something of the breadth of this field: Mike Chase is one of the most accomplished mask makers in the UK whose research into the diversity of mask usage is second to none. Ophaboom Theatre are a Commedia dell’Arte troupe whose work up and down the country and internationally does much to promote the form. Barbara Vijayakumar is a Kathakali Theatre specialist and the only fully trained female Chutti artist in the world. (Chutti is a sophisticated three-dimensional make-up made into a mask on the actor’s face from rice paste and paper). John Rudlin is our leading authority on Jacques Copeau. 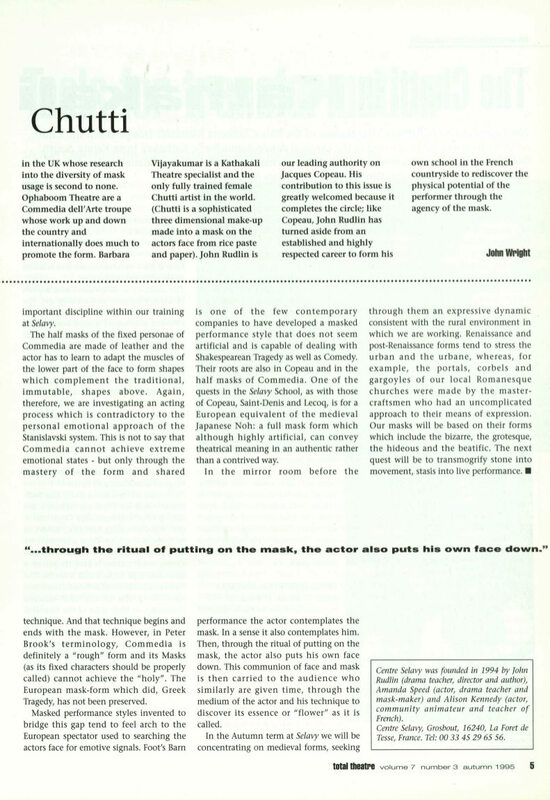 His contribution to this issue is greatly welcomed because it completes the circle; like Copeau, John Rudlin has turned aside from an established and highly respected career to form his own school in the French countryside to rediscover the physical potential of the performer through the agency of the mask.